Used as feature plants and hedging plants, Viburnums come in a range of varieties. Different growth habits and flowers that also vary in form. originally from Asia, Europe and North America, they are wonderful landscaping plants and deserve more attention. Flowering in late spring to summer, many varieties have showy flowers as well a great textured foliage. Some are deciduous, others are evergreen and many have fragrant flowers. The flowers appear in clusters, some appear as terminal flowers, others grow along the branches and create a tiered ‘wedding cake’ effect. These tough hardy shrub relatively drought tolerant once established. Good soil and light mulch will keep them happy in most temperate gardens. Being a generally hardy species, Viburnum thrive in full sun or part shade in a well mulched and well drained soil. 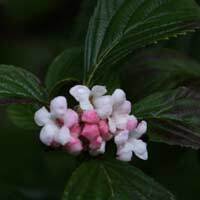 Viburnum plants and species found for sale in Australia include V. tinus, V. opulus and V.odoratissimum all are popular as garden plants and some make great hedges. Cultivars such as Viburnum Bodantense ‘Dawn’(pictured below right) is perhaps one of the most popular of all viburnums. Some are highly perfumed such as v. x carlcephalum ( fragrant snowball ), some with attractive flowers such as v. plicatum roseace and others such as v. odoratissimum var awabuki, with foliage that sets them apart in the garden. 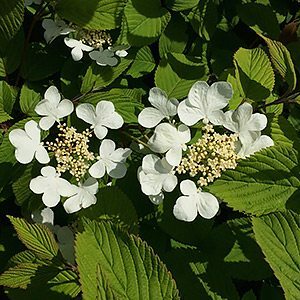 These versatile plants, varieties such as Viburnum tinus can be used as a hedge or screening plant. Viburnum Emerald Lustre is a popular cultivar for this purpose and is a great choice with its glossy leaves. In the garden border they work well both as a background plant, as well as a feature plant that is allowed to overflow onto a lawn. The scented flowers and attractive foliage and the easy to grow nature of viburnums make them a great addition to any garden. Viburnum grow well in full sun to part shade and are reasonably drought tolerant once established. Best grown in a sunny position with some afternoon shade in very hot areas. All Viburnums like a humus rich moist soil, however good drainage is also important. Protection from hot winds in summer is recommended.